Sorry that I have been missing in action this last week friends. I have been living every single moment trying to get our new office/craft/family room revamp project completed. It’s finally finished! It seemed like this project would never end because we had so many issues to overcome but in the end, all of the hard work (and hours of frustration) was well worth it. It really is a dream come true for me to finally have a dedicated space in our home for my daughter and I to create together. I’m not sure where to even start. I wish you were here so I could walk you through the space and tell you everything. There is also too much to try and share in just one post, so over the next few weeks, I will be sharing all of the little details and the projects that we did to make our little space special for us. This room was our daughter’s playroom and as you can see, we never did much with the space. Because my girl (at the time) was so little, we just wanted a place for her and her friends to play, eat and hangout. We didn’t want to worry about spilled sippy cups and goldfish embedded in the carpet. Our daughter is 9 years old now and prefers paints and crafts over toys (music to my ears!!) and well, the sippy cups are long gone (pass me some tissues). I also really needed an office and a craft/studio but we still needed a hangout space for our girl, so we decided to attempt to create a multi-purpose space that will fit all of our needs. click on the panorama shot to see the full size!! This is not a large space at all. In fact, it’s barely 250 square feet. Designing our new space was the ultimate challenge for me because I had to really maximize every inch without it looking cluttered. I wanted the space to be beautiful and calm but I also had to balance it with functionality and high durability. Can you believe that?!? 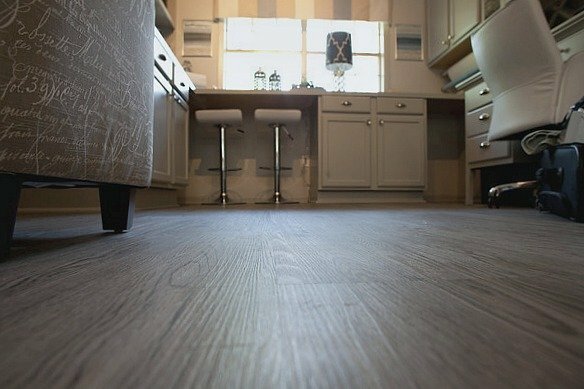 All I can say is that vinyl flooring has come a long way since my Grandmother’s kitchen floors! When my free samples from Build Direct arrived, I immediately contacted the company to see if they wanted to partner with me on this project because I could tell from their samples that their product was going to be extra special in this space. I do not normally do sponsored posts/product reviews on my blog but I was so impressed with the company, pricing and the quality level of the samples, I really wanted to showcase them on my blog and work with them on this project. The floors look even more beautiful than I imagined and my experience with Build Direct and their customer service has been fantastic. I love that they send you free full size samples (they ship them to you free as well! ), which makes it a lot easier to find the perfect floor for your space. 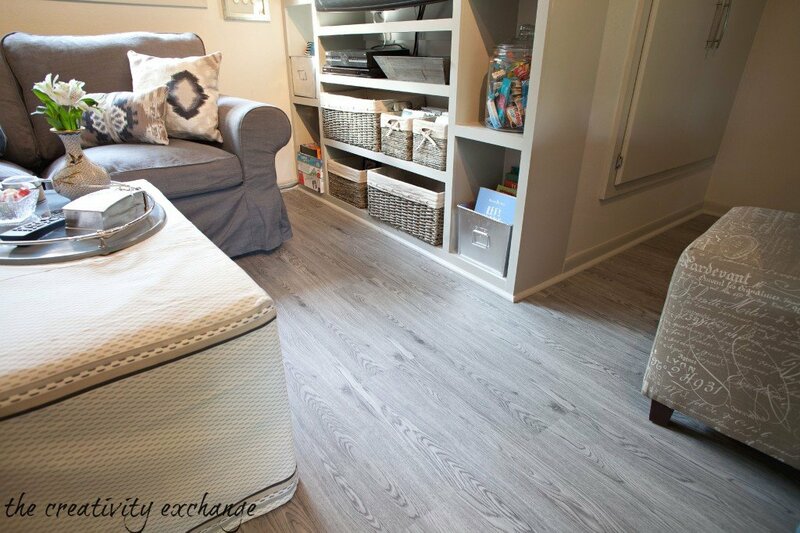 For more details about my new vinyl plank floors and how they are installed, you can check out my previous post here. Tying in this desk was really a challenge for me but I was determined to make it work because the desk had everything I needed. Thank you again to those of you who offered ideas for how I could make this work! As you can see, I took your advice and moved the desk closer to the door. If you missed the desk revamp and bulletin board project, you see that project here. 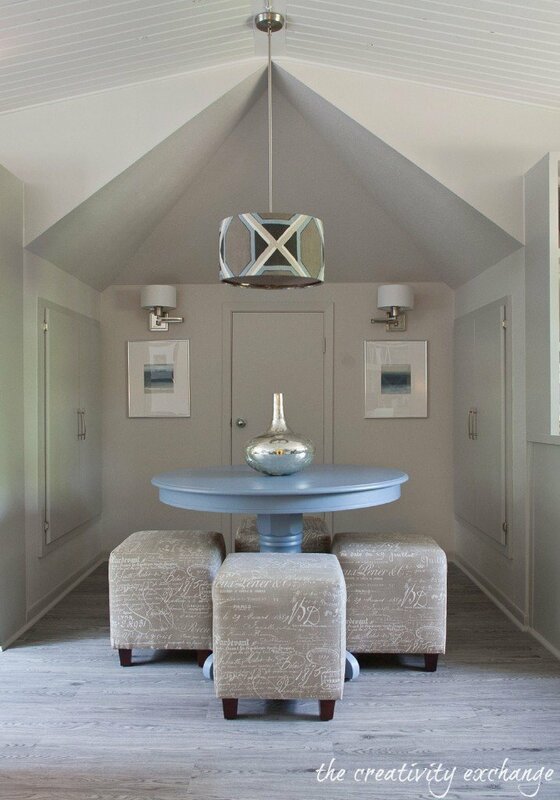 I love how the table turned out and the upholstered cubes from Ballard Designs were exactly what we needed. They slide under the table, so we can work around it without having to move chairs. 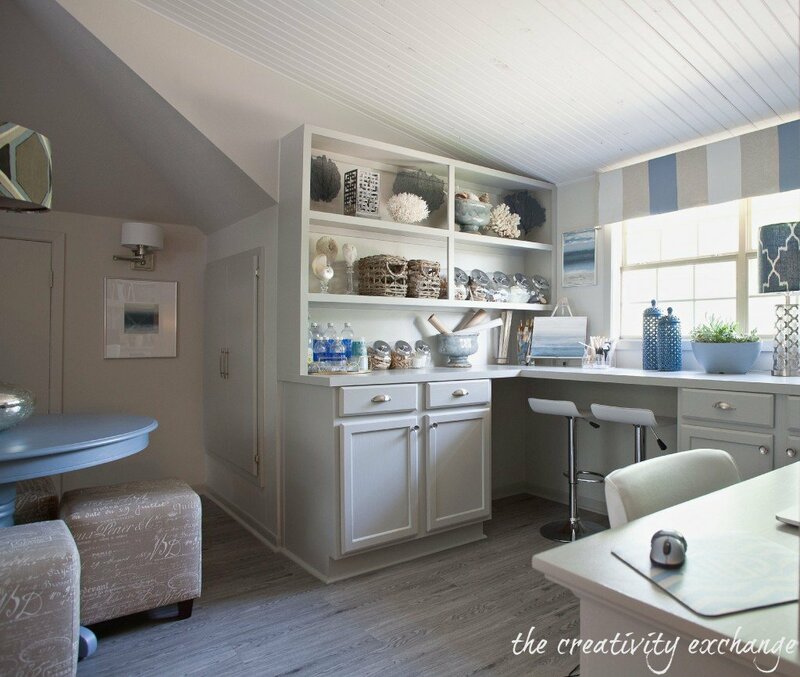 Also, I recently shared the details of how we saved so much money with all of the built-ins by using inexpensive pre-made stock cabinets and a few other tricks. 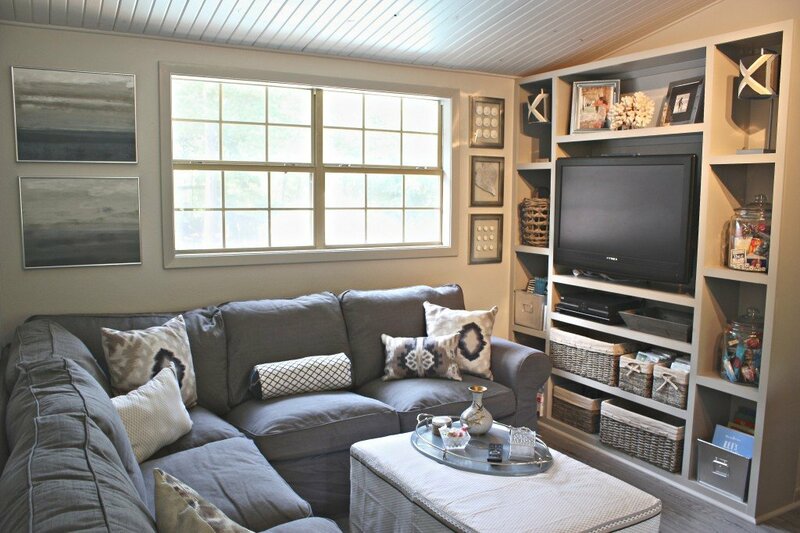 When all was said and done, all of the built-ins that you see in this space were done under $800.00! You can find that post here. Again, there are so many projects that were involved in this revamp that I can’t list them all in one post. 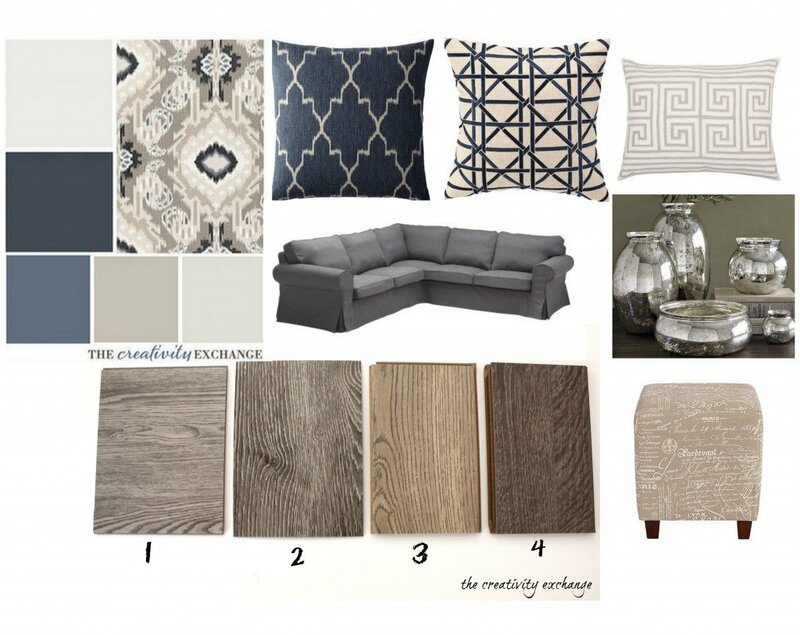 Today I wanted to focus on linking the projects in that I have already shared and over the next few weeks, I will be sharing the details from the construction, to all of the home decor projects and I will also go into some of the unique ways that we are organizing everything in this space. I had a lot of help with this project and could not have done it alone. I used my favorite local contractor, Jesus Terrazzas to handle all of the major construction for the revamp. Jesus and I have done a lot of projects together and I just can’t thank him enough for putting up with me wanting to be involved and hands on with each project. Thank you again so much to Build Direct for partnering with me on this project and to Shay Hobbs from Lens to Legends for photographing the space so I would have very pretty pictures to share with you all! I’ll be back soon with more of the projects from the revamp. Wow! Your room is amazing! 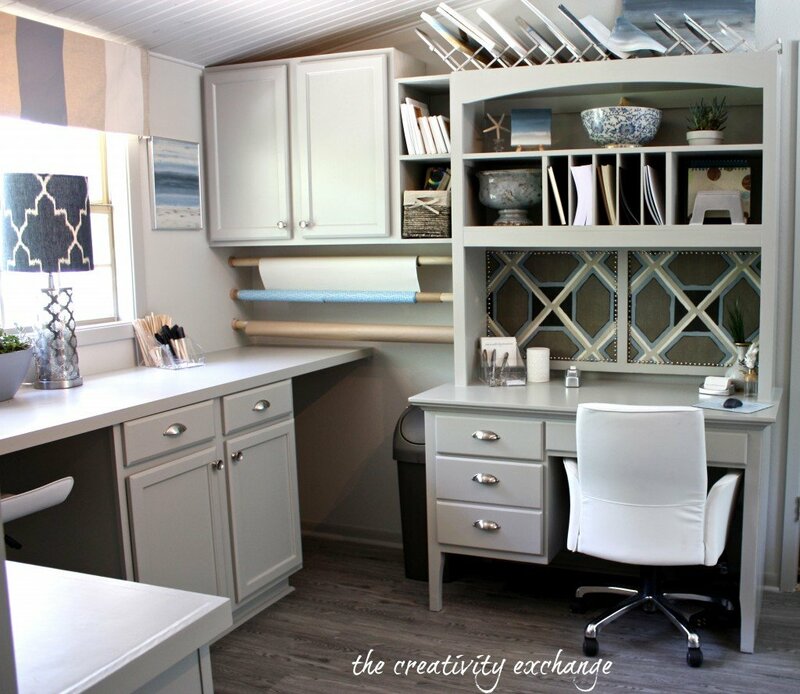 I wished my craft room was that nice. I’m in love with the swinging arm wall lamps. Where did you get them? Thanks so much Amy! The wall sconces came from Lowe’s and the brand is Portfolio and I believe they were only $24.00!! I couldn’t find the product on the Lowe’s website to link it for you and I’m not sure why it’s not on their. Maybe they are discontinuing it and my store happened to have a pair? The style number is #0185291 and they are in brushed nickel. I hope that helps! Thanks for stopping by! Oh that is cheap. I wanted a pair for our bedroom. I have been looking online for awhile and most are over 200.00 each. I absolutely LOVE it!!! Excellent!! Open, organized, relaxing and fun all in one! Thanks Missy! I can’t wait to get in there and start using it. Thank you again for stopping by! OMG. What a transformation. Your ability to see what you want in your mind and then pull it all together blows me away. You are so talented and the space is beautiful. You had great ideas for this project. Absolutely lovely! I love everything about this room! The colors, your art – everything!! I have a desk, that we need to change out…unfortunately it is not solid wood, as we wanted a wrap around office desk to fill our Study. Now I am regreting that decision of not buying a solid wood, we just couldn’t afford it at the time. The fake dark “wood paper” is starting to peel, and it’s heavy as all get out to move….AND we are planning on puting in bamboo flooring in the Study soon…via Build Direct. Don’t you just love them!!! I have ordered tons of samples trying to find the most perfect color, and they have stepped to the plate and sent my samples with no hassel, everytime! They are awesome, and their pricing is spot on! You should be so very proud of your new craft room, enjoy it!! Thank you so much Lisa! Yes, I absolutely LOVE Build Direct and that is exactly why I wanted to work with them! I think they are doing something so unique (and brilliant) by offering the free samples with free shipping so we can really look at everything and get a great feel. 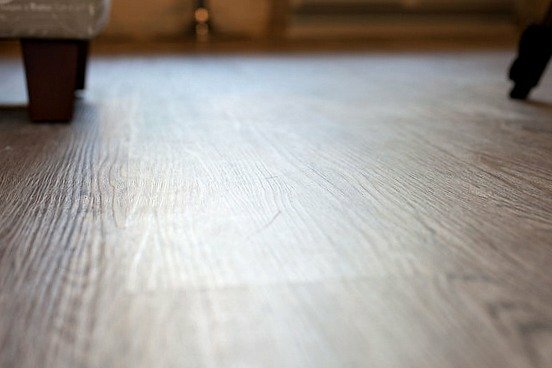 It helps that they have the most beautiful flooring out there (by far)! 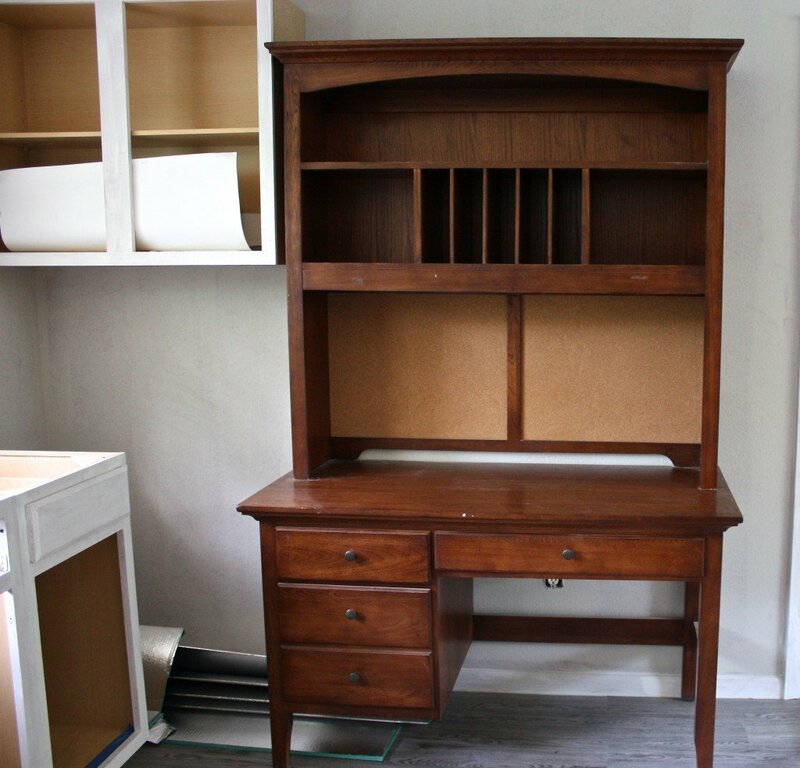 You know, you could still transform your desk even though it’s not solid wood. I have run across several tutorials on how to easily remove the laminate and paint it to where it looks just like solid wood. When I get a minute, I will send you a link to a tutorial for you to see what I mean. Ooohhh, yes I would love to see the link! Thank you! Total and complete goodness! LOVE. IT. ALL. M.
I have watched your progress from start to finish and must say that I am amazed at the transformation! It is absolutely beautiful. Love the artwork you created! Thank you Chris and thank you for following along with me. It has been quite the experience. I’m not sure how I made it through this project but it was worth it. Thank you again Chris for your kind words and hanging out with me here! LOVE the changes! I really like how you worked out everything to fit into this space, and as usual, your eye for SCALE is right on! I love how you worked out a way to not have to move chairs whenever walking by the table! 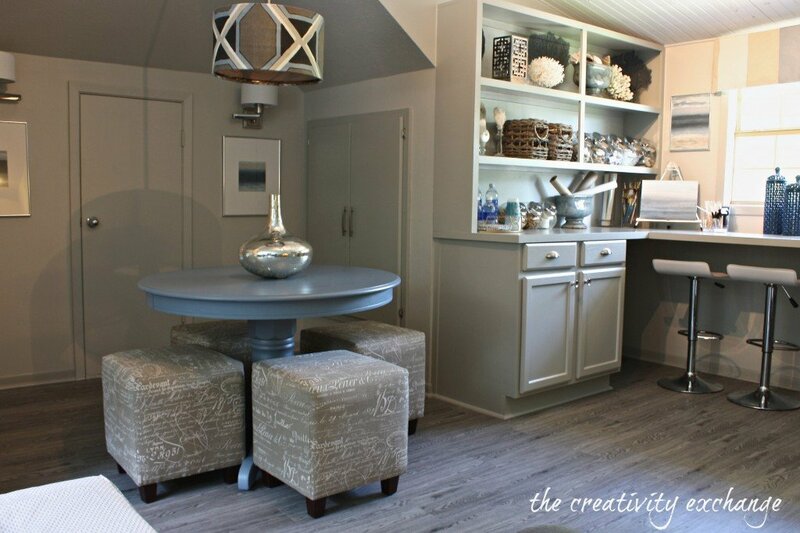 The color scheme is wonderful too… LOVE the flooring! 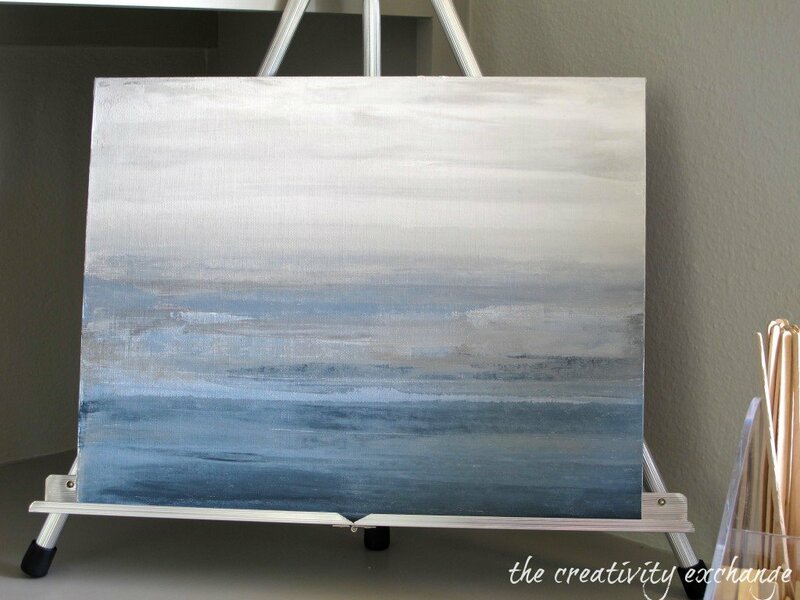 I had it in my mind to post a question as to where you to got those beautiful ocean (serene) paintings! Then when I saw they were your original ART! AMAZING! And they are perfect for this space! Kudos to you for doing an amazing job on this space! Thank you so much Mary Ruth and thank you for following along with me on this project. Your sweet notes along the way have really made me smile. I’m thrilled that you like the transformation. I can’t wait to get up there with my girl and do our thing. Thank you again for your always kind and encouraging words Mary Ruth! Absolutely lovely! You really transformed it into a very functional space. You are lucky to have a contractor and all the other companies helping out to complete your project. I wish I could find a contractor that will do a small wooden mantel, without charging an arm or a leg. Granted the fireplace surround has issues (not squared, made in the 80’s, everything is off center). Your transformation give me hope I might find a contractor out there! Great Job! Thank you Elsa! Yes, I am very lucky to have such an talented contractor to help me on my big projects. You could ask at your local paint store if there is a talented contractor that would do a good job at an affordable price. The guys at Sherwin Williams all know the local contractors and I bet they could recommend someone perfect for the job. Good luck and thanks so much for stopping by. Wow! It is beautiful and amazing! Where did you get your couch? I love it! Thank you so much Marcie! My sectional is from Ikea and here is the link:http://www.ikea.com/us/en/catalog/products/S99927586/#/S49910461 As far as sectionals go, it was very inexpensive and is really comfy and beautiful. great job! Love how all the colors coordinate so nicely. did Jesus build your shelving unit for your TV and the cabinets and shelves across from it? 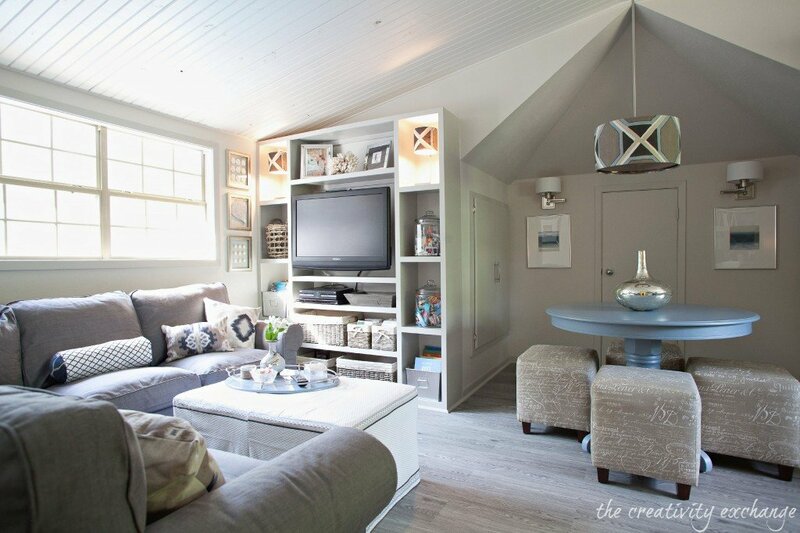 I would love to do something similar in my family room. keep up the good work! I love your blog! Thank you Susan! Yes, Jesus built the shelving and I will be sharing the details on the blog shortly. We saved so much money by using the wall as the shelf backing and we used standard size plywood (width) so we didn’t have to cut anything down. Because of that, the shelving literally only took a couple hours to put together and get on the walls! Also, we used ready made standard kitchen lowers on the bottom, which also saved money and time. Thank you Shelly! 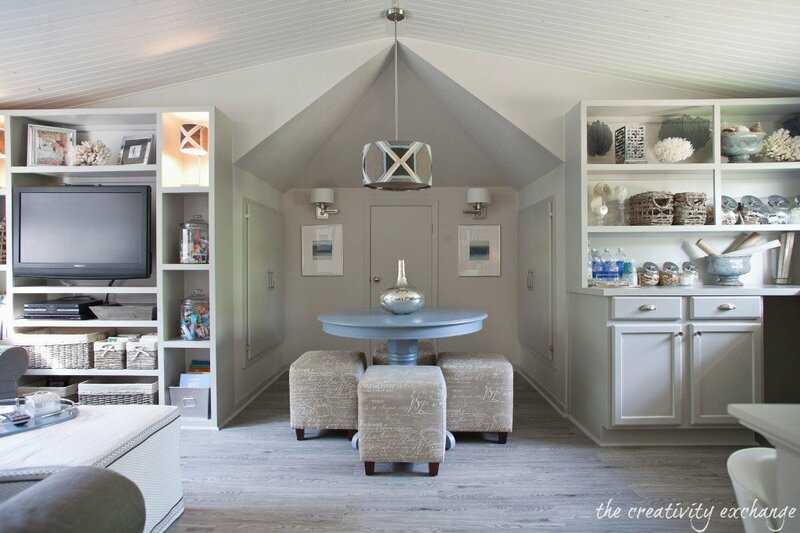 Yes, it’s a very small space and the floors, plank ceiling and light paint colors really made this space open and airy. I knew the lighter colors would help but I was so surprised by how much! I can’t wait to get in the space and start doing my thing! Thanks so much Shelly for stopping by! Help! I need tips on how to organize/store family photos. I would appreciate any tips and ideas from “the guru” of beautiful organization…. YOU! awe.. thanks sweet Alane! I have some ideas for you for the photos! In fact, I have a project coming up that I think will work perfectly! I will touch base with you to fill you in! Thanks so much girl!! Bug hugs! Oh my gosh! 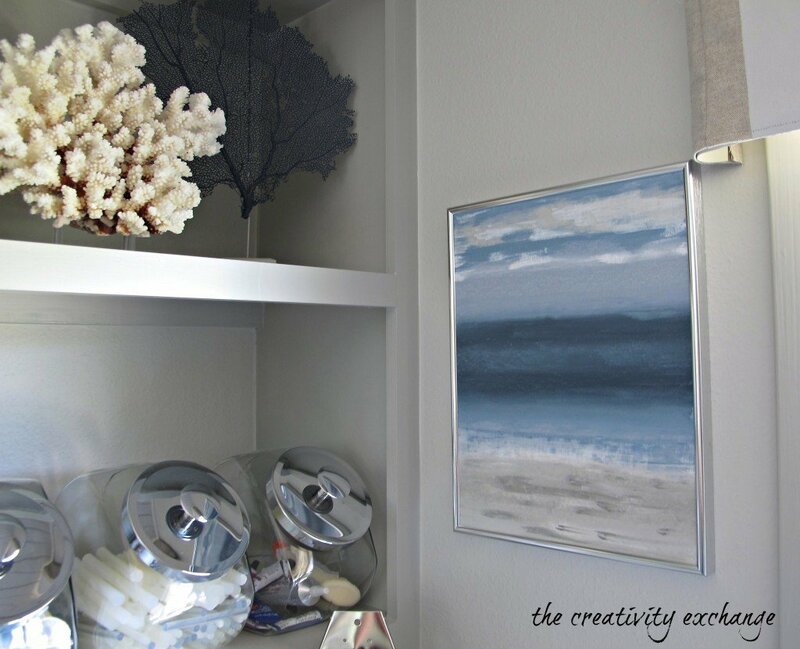 It is absolutely stunning, you have done an incredible job of utilising the space for three different uses and your colour combination is gorgeous, you have inspired me incredibly as I am currently doing up a guest bedroom (almost at my reveal) and an office/studio for me to paint in, which by the way is tiny. However, I was going to go with pale blue and I am now definitely going this direction. I have to keep looking at your images, I think you have done an incredible job and I would love to share the makeover on my blog. Your daughters paintings by the way are beautiful too and add a touch of serenity, does she sell on line? I will be in contact for some high res images to share with my readers. Thank you so much for stopping by and good luck on your space! Incredible! This should be in a magazine! 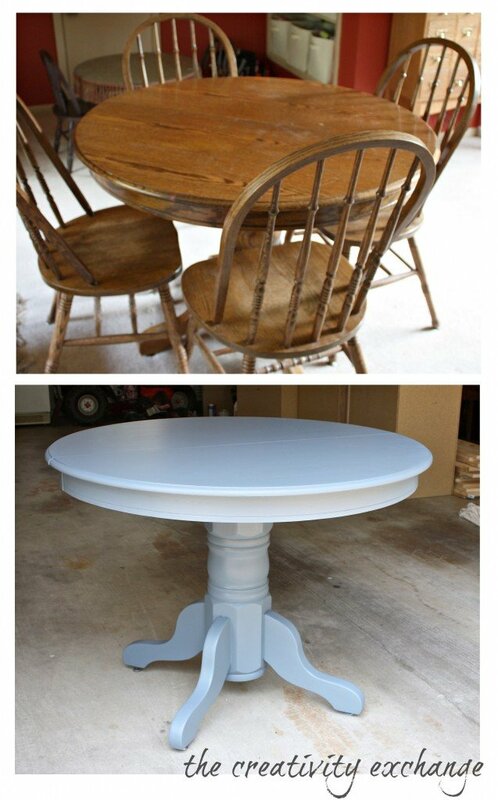 What a big difference the paint color makes! It looks lovely. Thank you so much Vicky!! You’ll have to come by and see it in person!! I am beyond thrilled for you. The room is beautiful, as are your paintings. I wish you many happy years of creating and memories here. Thank you so much Maureen! I can’t wait for my girl and I to start creating in our new space! Thanks for kind words and well wishes! Made my day! Wow! That is probably the most beautiful office/craft/creative space I have ever seen! Amazingly well done job, you should be incredibly proud of yourself. 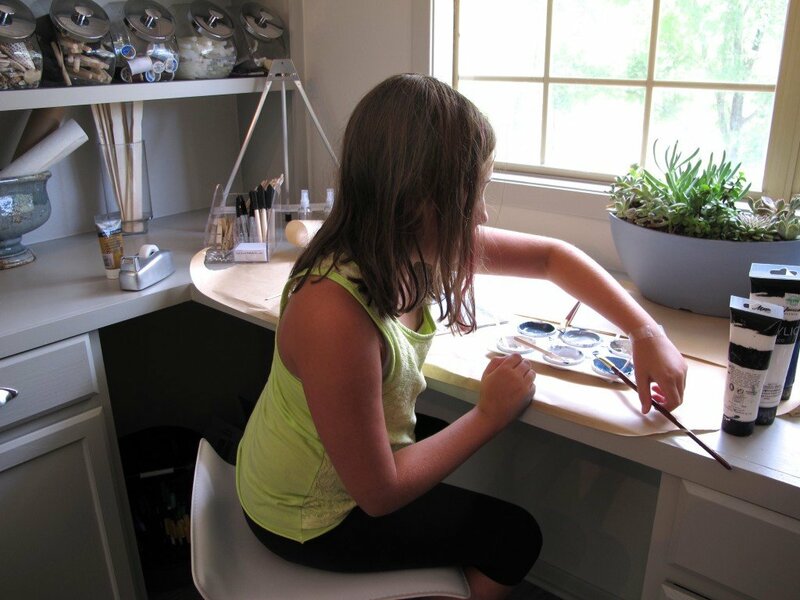 Your daughter is so lucky to have a mom who cares about creating a beautiful space to share with her. Your paintings are gorgeous, my first thought when I saw them was “those are beautiful, wonder where she got them?” Now I know that you painted them yourself! Do you sell them or do gigclees of them? Commissions? They are so lovely and serene and any sort of beach/ocean art is my favorite. I’d love to have a copy of those! I’m sorry that it has taken so long for me to respond Kimberly but I wanted to be sure and get back to you and thank you from the bottom of my heart for your kind words. Your note just made my day and warmed my heart! I was a little nervous about sharing my art work and I cannot tell you how your thoughts just made me smile! Thank you! I am not a professional painter and do not sell any of my paintings or have any prints. However, my plan with the craft room was to focus more on my painting and maybe take them to the next level and sell? Not sure yet. It would be a dream come true if people were interested in my paintings. Thank you again Kimberly for taking the time to leave me such a special note! Opps, I mean Kimberly! Ugh!! I can’t believe I did that! Please forgive me! I don’t think words can even describe how much I love this space! The colors you have chosen are so beautiful, and you are so so incredibly talented in how everything is placed in the room. I’m surprised you even had a chance to blog about it because I’m sure it’s hard to tear yourself away from creating. This is probably the most beautiful craft/family room I’ve seen EVER! Thank you so much Megan!! You made my day girl and I just can’t thank you enough for your kind words. Yes, I have been way too busy to be able to stop and enjoy the space. Hopefully this weekend I can do some more painting! By the way, I just checked out your nursery and it is really coming together so beautifully! I am so in love with the mobile and you have done a wonderful job of creating such a calm and beautiful space. Big hugs friend! Cyndy, Cyndy, CYNDY!! I was on the road yesterday, and saw this pop up on my FB page, but I couldn’t see the photos until I got online on my computer. SO gorgeous! I love everything you’ve done here – it all just works so beautifully together. And don’t sell yourself short with your paintings – they’re beautiful! I have a feeling you and your daughter are going to be making some wonderful memories in this gorgeous space! Well done! Thank you, thank you Jenny! I’m thrilled that you like it! Can you believe I finally got it done! Thank you about my paintings. I was nervous showing them and I really appreciate your sweet words. Hopefully I can slow down and get back in there and paint very soon! Thank you again Jenny so much! Oh, wow! I’ve enjoyed following this all along and am so inspired by you (as always!). This is so beautiful and functional! I’m also impressed with your art – they ‘spoke’ to me! I know it’s a joy to enter this space. You are incredibly talented, and yes, this should be in a magazine!! Awe, thank you sweet Robbie! Your words mean so much to me and you have inspired me so much for many years. You have no idea what it means to me to hear you say my paintings spoke to you.. Thank you for always encouraging and inspiring me. Love you! Cyndy, I just found your blog not too long ago as I was searching for help and inspiration over choosing a new paint color for my bedroom. Your blog is full of both! I love it. 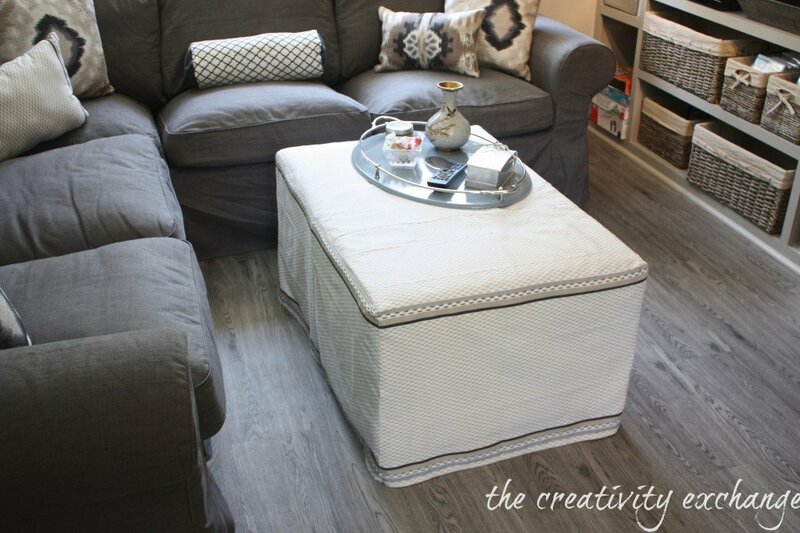 I rarely comment on the blogs I follow, but I can’t help myself after seeing your finished craft/family space. Your vision to pull that together, well, it’s truly a gift. Simply beautiful. And I tend to like more intense color – but I love this. Bravo. Thank you Shelley and I’m sorry for the delay in responding to you (I have been at a conference) but I wanted to be sure and respond and thank you so much for your kind comments. 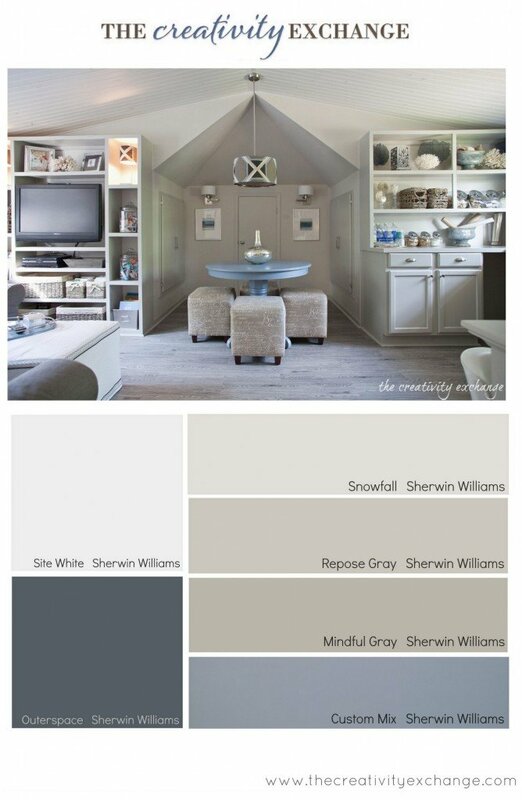 I hope you have found some potential colors for your bedroom in one of my color palettes, if not let me know! Thank you again! Cyndy, this room is over the top fabulous!! It was so good to meet you at Haven. What a fun weekend that was and looking forward to Haven 2014! Thank you Kim! I was just giddy to finally get to hug your neck and you know how I have adored you all of these years! Thanks so much for stopping by and I am so excited about guest posting in September! I’m already planning! Wow!!!!!!!!!!!!!!!!!!!!!!! You are one talented girl!!!!!!!!!!!!!! You did a super job! The revamped space is just beautiful. It’s evident that you put a lot of thought into the end result. Love it! I love your new made over space! The sofa came from Ikea!! Can you believe it? It was under a $1,000 and I was very impressed! Yes, it’s very comfy! Thanks so much for stopping by! Excuse me while I wipe the puddle of drool from under my chin. It so freaking gorgeous. Hi Cyndy, I am popping over from Sand & Sisal!! What a gorgeous job you have done on this room!! You are so talented and creative!! I am IN LOVE with this room and the colors you chose!! I’m pinning for inspiration! Absolutely a dream room. I’m totally inspired. I found you through Centsational Girl but I will be following you now and may even add you to my favorite blogs on my sidebar. Oh, this is so beautiful! I’m envisioning craft birthday parties for your daughter for the next few years, girls making candles, necklaces, picture frames, well – you would certainly know better than I! Thanks for sharing all this. Cyndy, this space is gorgeous! I love it and I love love love your art. You are so talented! I can’t wait to see where you go next with all your creativity. Wow! 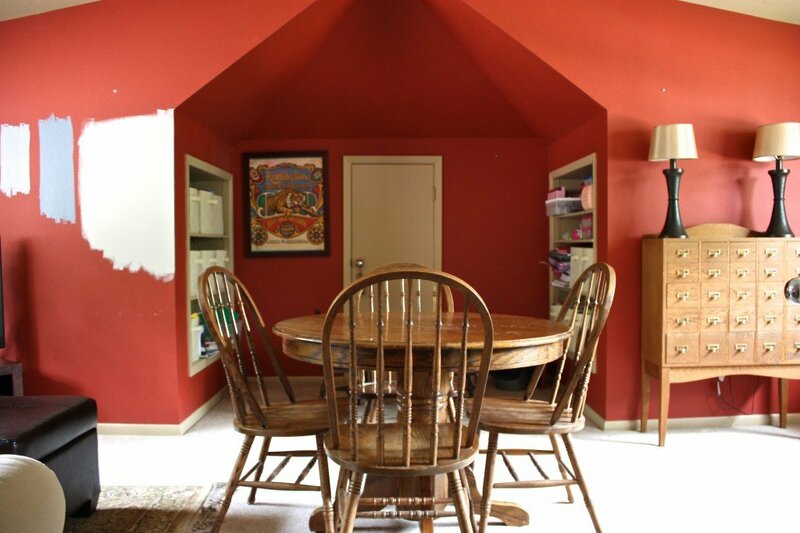 From red themes to pastel shades, the craft room looks better than ever. Great choice for the flooring, by the way. This is beautiful! What size room is it? Color me green! This is a gorgeous space and I’m totally jealous. The room I have is half this size but I don’t need the play area so you’ve given me LOTS of ideas. 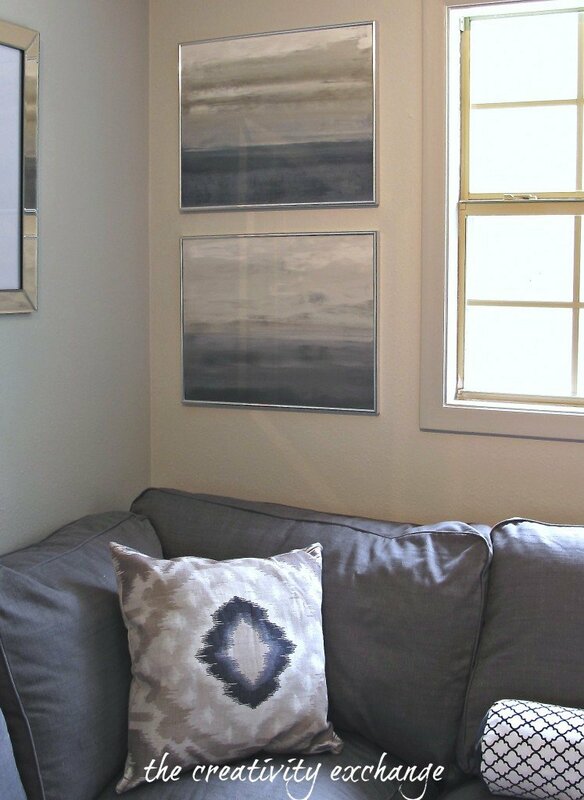 Your paintings are exactly what I have been picturing in my head for my living room. I’ve had difficulty finding anything I like until I came across your blog. I was so excited to finally see visually what I have had in my mind. As I read on I became disappointed because I realized they were your own works of art, not because you created them but because I couldn’t purchase them. I think your artwork is beautiful and your room turned out absolutely fabulous. Thank you for sharing it. The entire room is truly stunning. What I was most in love with was your daughters painting. I have been looking for a painting like that forever without spending thousands or even a thousand for a so-so print. If she ever decides to start selling her art please email me for I would be interested. Amazing talent shown by both mother and daughter. Wish also that you did online decorating for I love your aesthetic. Truly inspirational…. Your room is absolutely stunning!!! I am in love with your fabric on the pillow with the blue diamond shape in the middle. Any chance you remember the brand of fabric? Beautiful room! 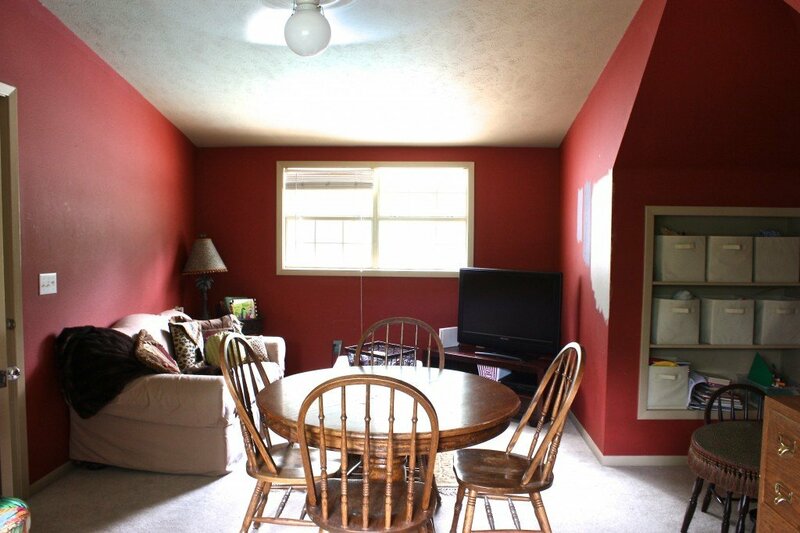 Where is that light hanging above the table from?